JEFFERSON CITY, Mo. 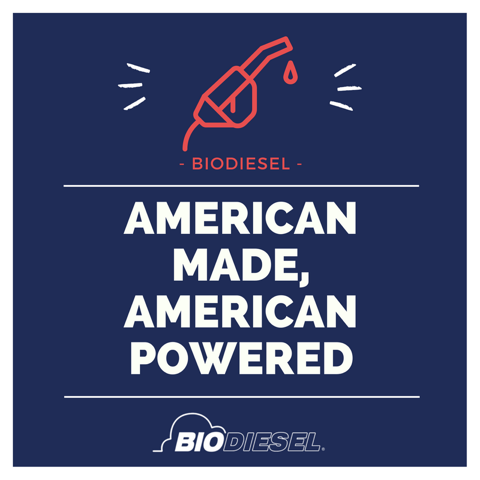 – As the nation celebrates its independence, American-made biodiesel is powering fleets across the country and supporting more than 64,000 jobs throughout the supply chain. Feedstocks: Biodiesel is made from easily accessible fats and oils. Resources are diverse and readily available. They include recycled cooking oil, soybean oil, animal fats, and more. Restaurants – Asheville, N.C.-based Blue Ridge Biofuels collects over 700,000 gallons of used cooking oil annually from nearly 1,500 restaurants in North Carolina, South Carolina, Tennessee, and Virginia. They use this waste oil to produce clean-burning, renewable biodiesel. “We not only produce and deliver biodiesel, we use it to power our own diesel fleet and many of our employees use it too” said General Manager Woody Eaton. Biodiesel Producers: There are nearly 90 NBB-member biodiesel plants across the country, collectively producing more than 1.8 billion gallons of biodiesel annually (2016). Renewable Energy Group, Inc. (REG), the largest biodiesel producer in the U.S., employs 690 people in the U.S. alone and indirectly supports thousands of other jobs. In 2016, REG produced 513 million gallons of biomass-based diesel in 12 plants, located in eight states. REG’s biodiesel production involved 46,616 truckloads across 43 states, 4,995 railcars, and 87 marine vessels. Quality Control Experts: Judy Elliott’s job is key to the biodiesel industry’s commitment to fuel quality. Elliott is one of seven independent auditors contracted with the National Biodiesel Accreditation Commission. Based in Crown Point, Indiana, Elliott audits biodiesel producers, marketers, and laboratories seeking BQ-9000 Producer or Marketer status under the industry’s strict quality assurance program. America is home to 13 labs and eight consulting companies that assist companies that are seeking BQ-9000 certification. These are just a few examples of the dedicated commitment to renewable energy across the biodiesel supply chain. Hundreds of fleets across the country are powering their vehicles with cleaner-burning, domestically produced biodiesel. Biodiesel users and advocates include the City of New York, Kettle Chips, Method Home Products, Disney, Harvard University, the Super Bowl, the U.S. military, Enterprise Rental Car, Clif Bar, and many others. Made from an increasingly diverse mix of resources such as recycled cooking oil, soybean oil and animal fats, biodiesel is a renewable, clean-burning diesel replacement that can be used in existing diesel engines without modification. It is the nation’s first domestically produced, commercially available advanced biofuel. NBB is the U.S. trade association representing the entire biodiesel value chain, including producers, feedstock suppliers, and fuel distributors, as well as the U.S. renewable diesel industry.